The third and fourth releases on Dave Rempis' Aerophonic label keep the quality level on high with an album of live recordings from the Rempis / Abrams / Ra trio and a duo firestorm from Rempis and percussionist Tim Daisy. 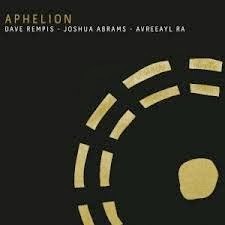 Aphelion was recorded on three separate occasions in two different Chicago venues, but there is nothing pieced-together about the audiophile sound quality or the unified vision of these 2013 performances. “Ruah” sets a meditative trance-inducing pace as Rempis blows long subtle notes between the plucks of Joshua Abrams' small harp and Avreeayl Ra's kalimba, setting you up for the build-up that's coming on “Noria.” This track opens with Abrams' bowed bass and some long and winding legato blowing from Rempis. When Ra makes an equally subtle entry, the trio begins slowly weaving a web around your head that when you realize what's going on it's too late to escape. The trio elevate and land repeatedly; and by the end Rempis is blowing overtone exhaust all over the place. “Saqiya” features Abrams' on guimbri, a guitar-like Moroccan instrument, while the trio establishes a slow groove, sounding a bit like Pharoah Sanders playing with the Gnawa people or a more sedate Ornette in Joujouka. This band is rooted in spiritual communication and demonstrates much openness in its approach, making this a very warm and inviting – as well as challenging – work. Thankfully, according to this article Paul sent me (see link below) the band plans to develop further and continue to play out on a regular basis. Aerophonic considers The Rempis / Daisy Duo's disc, Second Spring, to be the proper follow-up to their 2005 recording, Back To The Circle (Okkadisk). It has the sound and feel of a classic BYG/Actuel duo blowout and is one helluva wild ride. Starting things off is “Impasto,” on which Rempis runs up and down in rapid fire arpeggiation over Daisy's kinetic and powerful, yet somehow nonchalant, free Cuban groove. The subtle powerfulness dives deeper on “Numbers Lost,” where Daisy applies mallets to the toms and de-snared snare drum and cymbals, while Rempis rides on waves of overtones and pressurized steam. Then comes the realization that the two previous tracks have merely been the setup for the pure sonic meltdown of “Three Flags.” Rempis finds center after center to focus on - and then obliterate mere seconds later, frantically looking for what? The lost chord? Daisy does his epileptic centipede bashing with furious abandon. There are also two longish pieces (not counting “Impasto”). One, “Frijoleo,” serves as a thoughtful exercise in tension and release while the other, “Gerosten and Gesalter,” is all tension. Both tracks are great workouts and stand as fine examples of improvisation being primarily a listener's art form. And if that doesn't seem like enough variety for ya, check out “For R. Barry,” a beautiful, melodic piece that stands apart from everything else here – and yet is a perfect fit. Even though it doesn't exist, “For R. Barry” b/w “Three Flags” is my favorite single on the planet right now. Bravo Aerophonic! I couldn't agree more, Tom. I am looking forward to the Rempis/Daisy tour in March. Thanks Martin. Yes, I'd say that should be an awesome set of shows! The Rempis/Daisy Duo live at Trix (Antwerp)...Thursday March 6th double bill with Sweet Defeat (Tom Wouters, Bert Dockx, Lode Vercampt. Don't miss out !